Old Thatched Buildings at Bathurst. N.S.W is a framed landscape drawing on an unknown media. Barring the signature ‘H.W’ within the image, there is no further identifying information about who the artist was or when the work was created. The drawing comes from the sitting room of Chifley Home, home of Ben Chifley (1885-1951), the sixteenth Prime Minister of Australia and his wife Elizabeth (1886-1926). They lived in house at 10 Busby Street, Bathurst, New South Wales from 1914 to 1962. Since 1973, the home has been maintained as a museum. Overall, the object is in fair condition. However, there are two major concerns, both related to the materials and techniques used when the drawing was mounted. The acidic nature of the mount board used appears to be causing mat burn and degradation to the paper, as well as spotted discolouration on the mount. The way in which the drawing has been attached to the mount appears to have caused cockling and creasing of the paper by restricting the paper’s natural expansion and contraction. 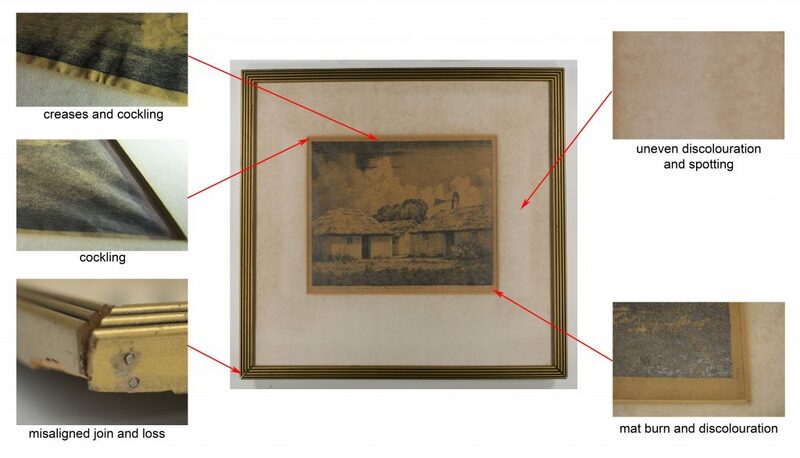 Further assessment of the condition of the drawing cannot be undertaken until the drawing has been taken out of the frame and mount. The frame appears to have fallen at some stage, as evident from two misaligned bottom mitred corners and a loss in the verso right bottom corner. 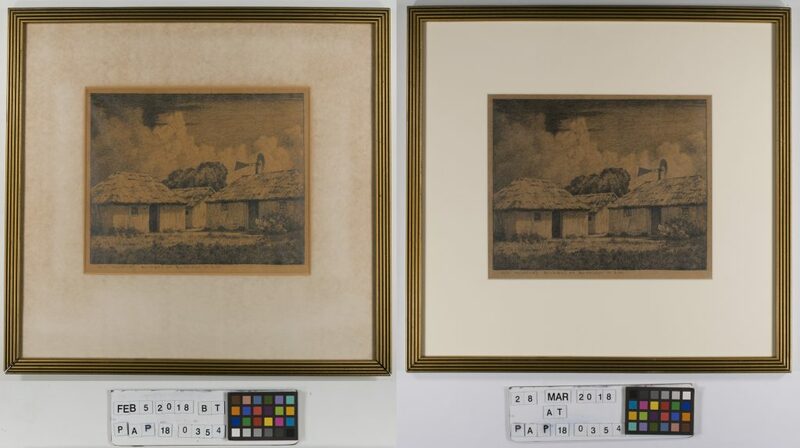 The aim of this treatment will be to improve the aesthetic appearance of the artwork and stabilise it so that the drawing can safely be displayed. Preliminary examination, research and condition reporting. Removal of artwork from frame. The frame will be conserved by a frames conservator. Backing and window mount removal to reveal primary support. Further examination and documentation of primary support and media. Dry cleaning to improve visual appearance. Solubility and conductivity testing to determine if the object can withstand wet cleaning. Wet cleaning subject to solubility to improve drawing’s appearance. Humidification and flattening to remove cockling and creases. Tear repairs, should any become apparent. Remounting and return to conserved original frame. Mount removed from frame, window and backing have been adhered to both recto and verso sides of the primary support. Gently paring back layers of the window mount with a scalpel to reveal the primary support beneath. The window was adhered to the primary support along the two side margins and adhered to the backing above the top edge and below the bottom edge the primary support. Window pared back until only one to two layers of paper remained at the adhesive sites along the side margins of the primary support. Several issues became apparent at this stage of the treatment. First, the edges of the primary support were severely embrittled due to the application of adhesive. Second, there were several small tears along the edges of the primary support which may have been caused by the combination of brittle edges and tension across the surface of the primary support. Last, the adhesive application on the verso of the primary support was different to its application on the recto. On the verso, the adhesive was applied in the thin line along all four edges of the primary support, which in several areas had failed, creating uneven tension across the surface. Close up of the final layers of paper at adhesive sites. A gel of 5% methylcellulose in deionised water was applied to the remaining paper for 5 minutes allowing it to solubilise before being gently scraped away with a dental pick. Window mount fully removed. Full extent of verso adhesive failure became apparent, with the top half of the primary support unsecured. The backing board. with primary support still attached, was flipped over and the paring back process was started again. As the could not be fully secured to the bench, it had to be weighed down by glass weights to stop movement while the mechanical action of the paring back was performed. Bottom edge of the backing removed. Temporary repairs were made with Japanese tissue to stabilise the tears while the object underwent mechanical force. Backing removed completely. Eight temporary tear repairs were required to protect the primary support during the mounting removal process. Now that primary support has been completely removed from the mounting system, more accurate condition reporting can be undertaken and cleaning can begin. Solubility testing was conducted on the paper and drawing to determine whether washing the paper to remove discolouration and degradation products was possible. Solutions tested include deionised water, 50:50 v/v ethanol and deionised water, and pure ethanol. It was found that while the overall paper discolouration was soluble in deionised water, ethanol was required to solubilise the mat burn. This was an issue as it was found that the drawing media was also soluble in ethanol. While the solubility of the media in ethanol indicated that it was crayon, it also meant that there was a high risk of removing the drawing all together if ethanol was used to lessen the appearance of the mat burn. It was decided that this risk was too great, even with careful localised applications along the burn, and only deionised water would be used. Due to the embrittlement of the paper, it was extremely fragile and susceptible to further tearing. As such, it was decided that blotter washing would be used as the paper could be supported the whole time and not tear under its own weight when wet. Blotter washing involves dampening thick blotter paper with conductivity adjusted water. The object is then placed onto damp blotter and the surface of the object is sprayed with more conductivity adjusted water. The capillary action of the damp blotter wicks the water and decolouration from the surface of the object down into the blotter. 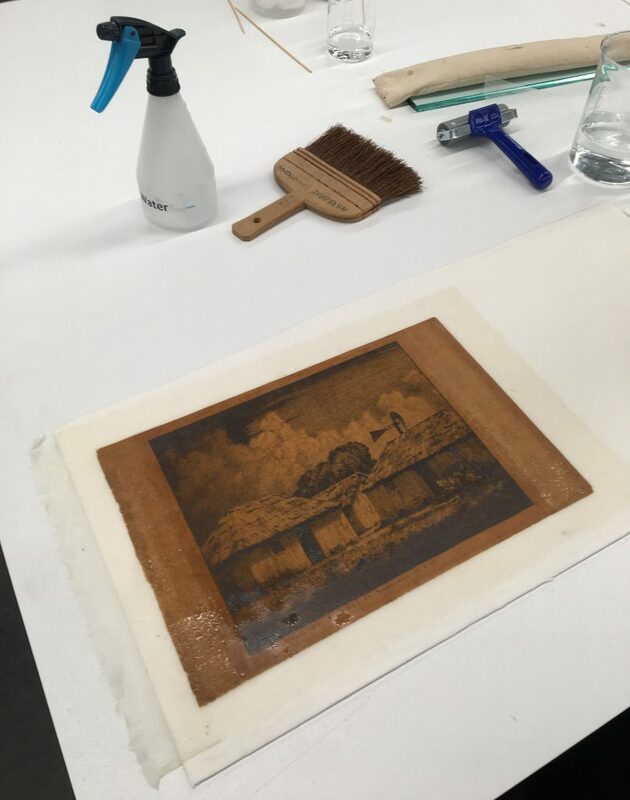 This process is repeated until no more discolouration is removed from the object, which is then removed from the damp blotter and left to dry under weights. The difference washing has had on the object is profound. Not only is the visual appearance of the paper and drawing clearer and less orange, but the structure of the paper itself has improved. The paper is no longer brittle, is more pliable and less likely to fracture with handling. After washing and drying was complete, all tears were repaired using Japanese tissue and wheat starch paste on the back of the paper. 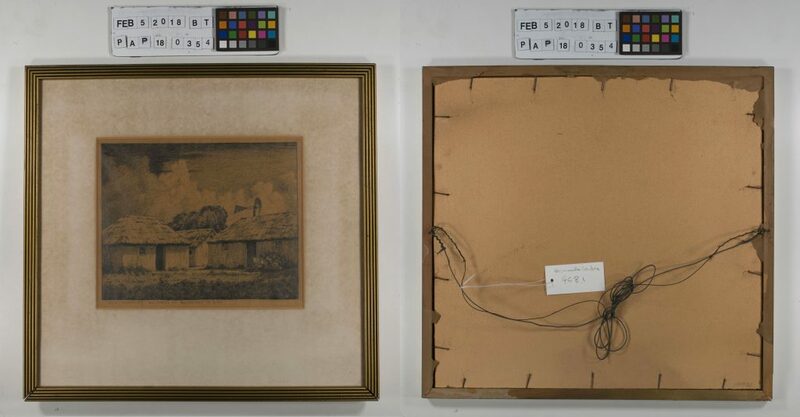 The drawing was then remounted into archival quality mount and returned into the conserved frame with a new hanging system attached. I would like to thank my supervisor Libby Melzer and fellow peers for their ongoing support throughout this conservation treatment. I would also like to thank Chifley Home and Education Centre and Bathurst Regional Council for allowing me the opportunity to work on their object.